The MERIT-BIEN award for Best Overall Project went to Justin Bare, a rising ECE senior at the University of Maryland. His project, titled "Automatic Volume Leveler for Real Time Speech Applications." The annual fair showcasing undergraduate summer research projects from the Maryland Engineering Research Internship Teams (MERIT) Biosystems Internships for Engineers (BIEN) program and the Training and Research Experiences in Nonlinear Dynamics (TREND) program was held at the Jeong H. Kim Engineering Building on Friday, August 5, 2011. MERIT-BIEN and TREND constitute a unique, 10-week summer research program that offers top undergraduate engineering, mathematics and physics students from around the country the opportunity to engage in cutting-edge, team-based, cross-disciplinary research projects at the University of Maryland. MERIT-BIEN projects range from nanotechnology and microelectronics devices to autonomous control, information security, system modeling, and speech recognition.TREND projects included centrifugal plasma confinement, magnetic reconnection and the dynamics of energetic particles, nonlinear dynamics in charged particle beam systems and optical systems, and the dynamics of soft matter and chaos. The MERIT and TREND Fair is a half-day program that provides student teams a chance to showcase their work to a wider audience, and to be judged on the quality of their research efforts. The students spoke about their individual projects in the morning, and later discussed their projects with visitors and judges at a poster session. Student projects were scrutinized by an independent panel of judges. 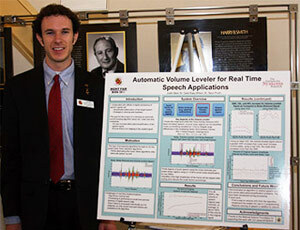 The MERIT-BIEN award for Best Overall Project went to Justin Bare, a rising ECE senior at the University of Maryland. His project, titled "Automatic Volume Leveler for Real Time Speech Applications," focused on the development of an automatic volume leveler to handle the problem of attenuation/amplification inherent in the enhancement of a speech signal. This advancement would restore the signal loudness and tilt to a level similar to that of the produced speech signal. The faculty advisor for this project was Professor Carol Espy-Wilson, and the research was co-advised by Dr. Tarun Pruthi. The MERIT-BIEN award winners for Best Presentation were Melonie Hardy of Shorter University and Brigitte Liu of City College of New York for their project titled, “Securing Biometrics Data: A Comparative Study.” Their research focused on a comparative study between representative techniques that were proposed for the purposes of securing biometrics data as well as securing communications between a client and a server. The techniques examined were: homomorphic encryption and cryptographic protocols, error correction coding based technique, and transformation using random projections. The faculty advisor for this project was Professor Min Wu and the co-advisor, Wenjun Lu. The MERIT-BIEN award for Best Written Report went to Hetal Patel of George Washington University and Daniel Silversmith of the University of Maryland for their project, titled "Nose on a Chip." Their aim was to create a prototype olfactory sensor (“nose on a chip”) by interfacing olfactory sensory neurons (OSNs) with a microelectrode array (MEA) and observing extracellular electrical impulses in response to various odorants. The faculty advisor for the project was Professor Pamela Abshire of the University of Maryland, with co-advisor Timir Datta-Chaudhuri. The TREND award for Best Overall Project went to Dustin Anderson, a student at Carleton College in Minnesota, and Ari Tenzer, a student from Washington University in St. Louis. Their project, titled “Interaction of Oscillator Communities in Large Networks of Networks,” examined the dynamics of oscillators in a community. The faculty advisors for this project were Professor Edward Ott, Professor Thomas Antonsen, and Professor Mucleele Girvan. Anderson and Tenzer were also supervised by Gilad Barlev. The TREND runner-up for Best Overall Project went to Zack Lasner of Pomona College, Claremont, California for his project, titled "Charge Buildup in Sandstorms." Investigating triboelectric charging, a poorly understood process by which insulators of identical material become statically charged upon contact, this project strives to elucidate observations that external fields significantly contribute to the charging process in natural sandstorms. The faculty advisor for the project was Professor Daniel Lathrop with co-advisors Donald Martin, Daniele Zimmerman, Hansen Nordsiek, and David Miechle. This year, 14 students participated in the MERIT-BIEN program, while 10 students participated in the TREND program. The MERIT-BIEN program is supported by the National Science Foundation (NSF) while the TREND program is supported by NSF and the Department of Defense (DoD). For more information about the MERIT-BIEN program, please visit http://www.ece.umd.edu/MERIT. For more information about the TREND program, please visit http://www.ireap.umd.edu/TREND/.